Here's how it all started: Some of the 5th graders were picking on some smaller kids in your child's 3rd-grade class. He gathered his friends, brought them down to your rec room, and they all sat around the table, deciding what to do about it. Eventually, they landed on forming a secret society of knights who's job it was to defend the freedom and honor of every citizen, big and small, at their school. It was their duty, they decided; and then they celebrated with a round of fruit punch. And sure, it won't fly with the principal, but it is pretty cute to see them get all dressed up and practice their swordplay in the name of justice! We don't blame you for going along with it for a little while. Encourage your little one's bravery by getting him this Boy's Black Knight Costume. In it, there'll be no hiding from the risks of battle, but hey, the fact that it's a bit gruesome just means it'll also make for a perfect Halloween costume, should their new "order" fail to take off. This is a terribly effective look for scaring off bullies. It's a play on a classic knight's ensemble, with a top that boasts an official crest and realistic looking faux chain mail. The boot toppers help bring his modern denim and kicks back to medieval times, and the mask is downright irksome. 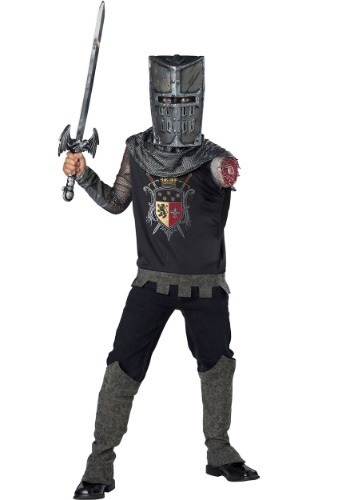 But let's not skip over the most...noticeable...part of this cool costume: your little knight is missing an arm! He'll have fun thinking up a tall tale to accompany his injury—one to scare off all who stand in his way! If there's anything your little one has realized since becoming a knight, it's that fairness and justice come at a price! Let his imagination run wild in this horror-inducing look—it's what Halloween is all about!